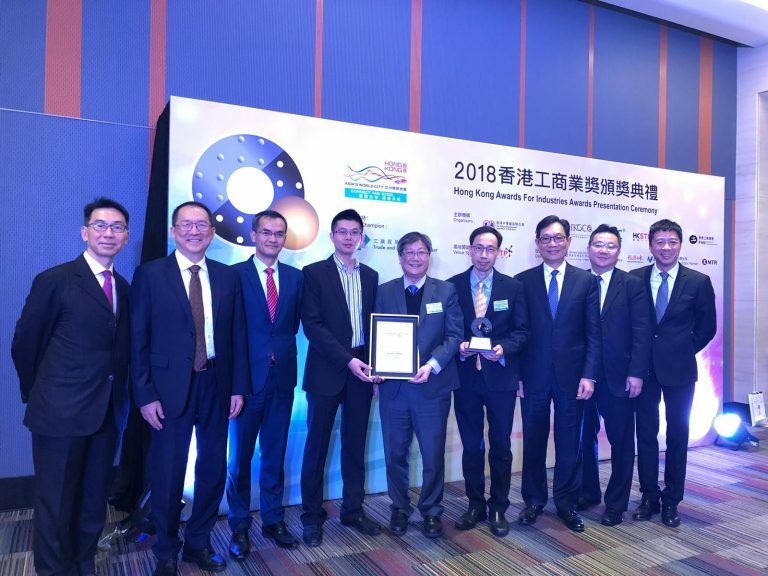 [Hong Kong, 12 December 2018] The Hong Kong Science and technology Research Institute (ASTRI) Company Limited has been recognised once again for its innovation excellence – this time with three awards at the Hong Kong Awards for Industries (HKAI) 2018. The Awards’ presentation ceremony was officiated by Mrs Carrie Lam, Chief Executive of Hong Kong SAR. A total of 259 entries were received in the 2018 edition of HKAI. ASTRI received three honours: 1) Technological Achievement Award for its Narrowband Internet of Things solutions, 2) Equipment and Machinery Design Certificate of Merit for the All-in-one Virtual Reality Head Mount Display, and 3) Equipment and Machinery Design Award for the Collaborative Mobile Manipulator for Industrial Head Clean Room, jointly with its partner SAE Magnetics (Hong Kong) Limited. Technological Achievement Award for Narrowband Internet of Things (NB-IoT) solutions: ASTRI’s NB-IoT solutions include an IP platform that supports the 3rd Generation Partnership Project (3GPP) standard for User Equipment applications consisting RF transceiver, digital baseband, power management unit and power amplifier. The design and implementation of the solution enable miniaturised chips, saves design and production cost, and facilitates a wide range of applications and devices in the modern era. Equipment and Machinery Design Certificate of Merit for All-in-one Virtual Reality Head Mount Display (HMD): ASTRI developed the unique all-in-one HMD device that leverages both Virtual Reality and Augmented Reality technologies. Its innovative sensor fusion and optimised operating system offer advanced multi-functional features for numerous Smart City applications such as healthcare, infotainment and education. Equipment and Machinery Design Award for Collaborative Mobile Manipulator (CMM) for Industrial Head Clean Room: SAE Magnetics (Hong Kong) Limited and ASTRI developed the CMM platform with mobility, sensing and manipulation capabilities for reconfigurable, flexible, and highly automated manufacturing. Equipped with advanced sensors and able to significantly reduce operational complexity, the CMM can work autonomously or collaborate with human operators. It has a very wide application potential across Smart Factories in the Industry 4.0 era. It is particularly suited for material logistics and automatic work cells that produce magnetic heads in a clean room environment.